I have written articles about this concept on numerous occasions for Leibish & Co., so the visuals may seem familiar. The concept of wealth concentration is not new at all. In fact, monarchs and other prominent figures in history used diamonds and other precious gems to measure their great wealth in a “treasure” box. This isn’t just a manufactured scene for movies and cartoons! It is a well known fact from throughout history, since the beginning of time. Lords and Princes, Kings, Dukes, Queens and Ladies all kept precious gems on hand not just for their beauty but also for their value and concentration of wealth that they provided. Even merchants and people of less noble birth kept gems on hand, and for the very same reasons. On numerous occasions, they were able to barter their gems for passage on ships, for food for their constituents, and even for their lives. The old trend of concentrating money into gems has been reborn during the past 25-30 years, when fancy color diamonds have been revealed to be not just valuable but also a rare type of precious stone. The combination of these facts is a key reason that they produce so much value in the market. In fact, the value of fancy color diamonds has not stopped increasing, especially the value of the rarest and most unique diamonds – those are truly one of a kind! This phenomenon, while kept secret for so long so that it could be enjoyed by the few instead of by the many, is finally becoming common knowledge and allowing an increase in the demand for these diamonds, although the supply is only diminishing, as diamonds are an unrenewable natural resource. In order to visualize and to substantiate this claim, I went back in history and researched fancy color diamond prices in auction houses, going back to 2003 and reviewing it in increments of 2 years. I decided to compare it to other, more traditional precious commodities such as gold and platinum, and added a more trendy alternative investment such as a work of art, which investors had started utilizing much earlier than diamonds. Of course, I also added unique colorless diamonds to the comparison. In order to level the comparison so that these very different things could be compared, I calculated each as the price per gram that the item realized. This meant finding out the weight of each item, calculating it in grams, and dividing the price by the total grams in order to deduce the price per gram. Diamonds have a standard conversion of carats to grams, and gold and platinum are weighed in a standardized measure per bar, so the only challenge here was finding out the dimensions of the painting (or sculpture in one case, calculating the total weight followed by finding out its weight per gram). This now allows us to compare all of them faithfully. While searching online on both Christie’s and Sotheby’s websites for the price results for art and diamonds, I was able to find data going back to 2003. Although I would have preferred to have data going back further in order to asses the behavioral trends even more thoroughly, for the purposes of this article, having 7 points in time is enough to show a consistent trend (one date each in 2003, 2005, 2007, 2009, 2011, 2013, 2015). 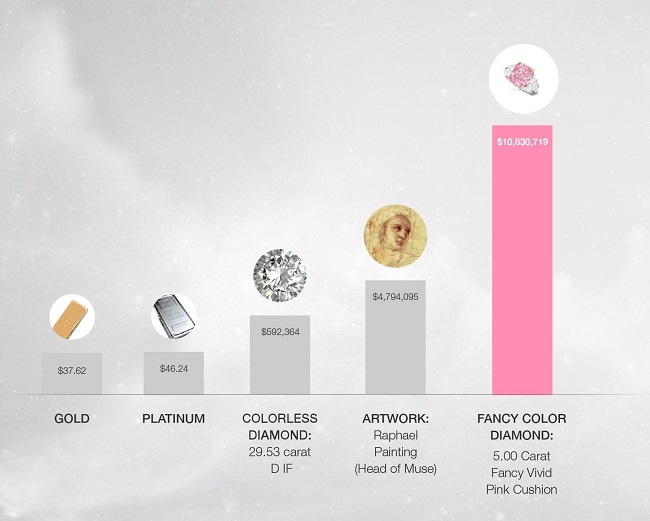 It is absolutely shocking to see how much value in is 1 gram of a pink or a blue diamond as compared to gold, platinum, a colorless diamond, or the most expensive work of art. Working backward with the knowledge that on December 11, 2003, a 5.00 carat Fancy Vivid Blue diamond sold at auction for $2.2 million, I looked for the highest sale price that year at auction of a famous work of art (in this case, Modigliani’s Nu Couche), and a significant colorless diamond, in this case a 63.93 carat D color Flawless oval shaped diamond. I also took that day’s trading price for gold and platinum to complete the comparison’s effectiveness. From the graphical presentation (which by the way, can be easily verified by anybody on Yahoo! Finance, sothebys.com, and christies.com), we see an interesting relationship between gold and platinum. Gold was valued at $13.06 per gram, while platinum was valued at $26.01- twice as much. I also chose the most expensive colorless diamond sold that year, and on that date, a 63.93 carat, D color diamond with Flawless clarity, and it sold for a converted value of $329,354 per gram, substantially higher than gold and platinum. I also looked up at the most expensive works of Art that year, and guesstimated its weight per gram according to the size of the painting. I came up with an approximate value of $53,775 per gram (even if I had made a substantial mistake of calculation of 20%, it is still extremely far off from the colorless diamond). Now, we always say that we save the best for last. That year, a record was broken, and a 5.00 carat, Fancy Vivid Blue got auctioned off for an astounding price that converted to a value of $2,024,000 per gram. Being that it weighs less than 1/12th of the colorless diamond, yet is valued at more than 6 times per gram, it is astonishing that it sold for that much. And yet, as those well versed in the fancy color diamonds know, the value of certain fancy color diamonds is absolutely extraordinary. A short two years later, we can see that the relationship between gold and platinum is about the same, which is twice the value, and shows consistency. There is a 27% increase in wealth concentration for the colorless diamond, and just over a 21% increase in wealth concentration for the work of art. In this year, our most expensive colorless diamonds was a 50.01 carat D color potentially Flawless (meaning that an experienced diamantaire would have strongly considered repolishing it to bring up its clarity from Internally Flawless to Flawless) emerald cut diamond, a 3.10 carat Fancy Vivid Purplish Pink oval shaped diamond, and Canaletto’s famous painting ‘Venice, the Grand Canal). 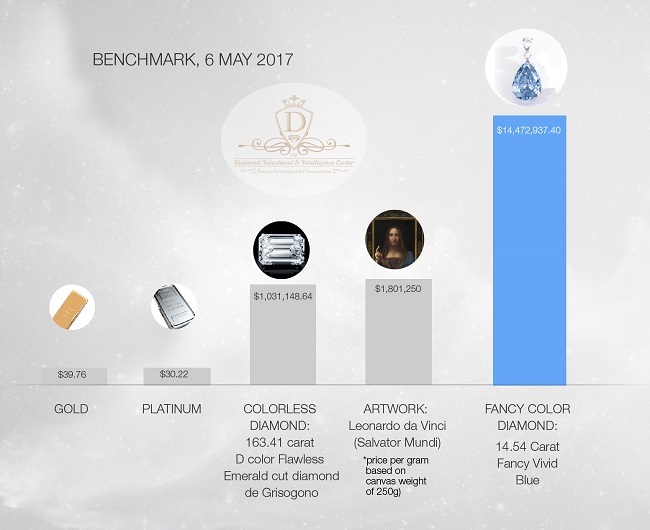 The most substantial and positive increase was for the Fancy Color Diamonds, where the wealth concentration showed an increase of more than 45% from the previous 2 years. I can only conclude that the desire of fancy color diamonds has increased during that time than any other alternative investment vehicle. The relationship between gold and platinum remains somewhat the same, just a small change, but both of them show an increase by almost 76% and 56% respectively, a major increase regardless. The most expensive colorless diamond sold that year was an 84.37 carat D color Flawless round brilliant diamond, the most expensive color diamond was a 6.04 carat Fancy Vivid Blue emerald cut diamond, and the mot expensive artwork was Rothko’s White Center. Interestingly, the value of the works of art did not change in a dramatic way, only increasing by a modest 12% over the 2 year period. 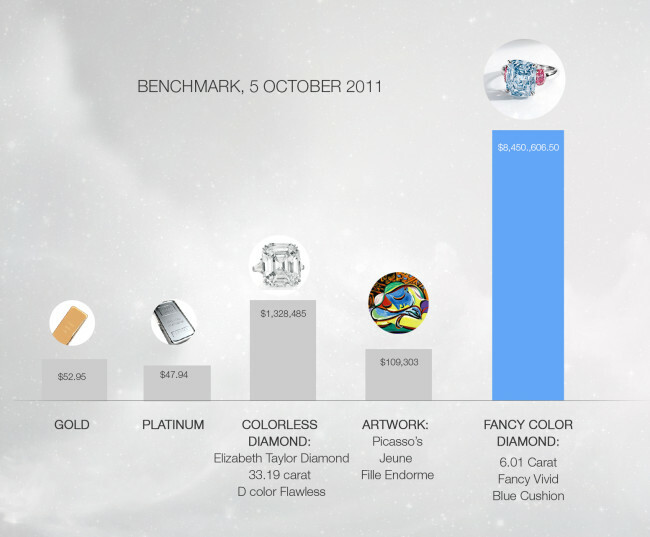 The colorless diamond increased by a whopping 128% over that same period. In line with the behavior of the colorless diamond, the 6.04 carat Fancy Vivid Blue broke a record by increasing by over 124% during the 2 year period. 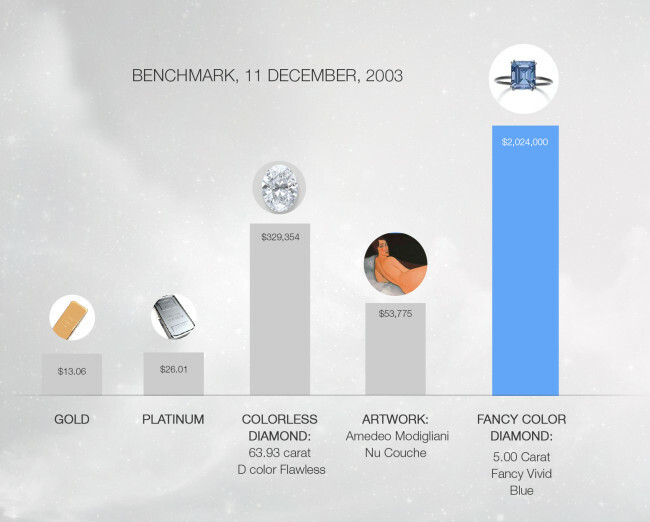 If we compared the 2 top performers, the colorless diamond and the fancy color diamond to their values in 2003, the colorless diamond increased by 191% while the fancy color diamond increased by 226%. In this year, we see further increases in value in every commodity except for the colorless diamond. Gold showed an increase of over 60%, and platinum increased by a modest 6%, most likely covering inflation. The most expensive colorless diamond sold that year was a 29.53 carat D color IF round brilliant diamond, the most expensive color diamond was a 5.00 carat Fancy Vivid Pink cushion shaped diamond, and the most expensive artwork was Raphael’s Head of Muse. The colorless diamond got a big hit in value with its decrease of over 38%, although it also happens to be a much smaller diamond compared to the previous ones at under 30 carats. This may have possibly lead to less demand for it seeing as how it isn’t as large as the major colorless diamonds sold previously, and size is one of the most important factors in colorless diamond demand. In the world of art sales we see the most major increase of value, an incredible 6481%. Artwork made headway most likely to the size of the portrait, which allowed for an increase in wealth concentration. Fancy color diamonds continue to lead the pack with an increase of almost 64% over the 2 year period. In 2011 we see a continued momentum in price increase of gold and the price stability of platinum, most likely caused by 2008’s turbulent financial crisis. 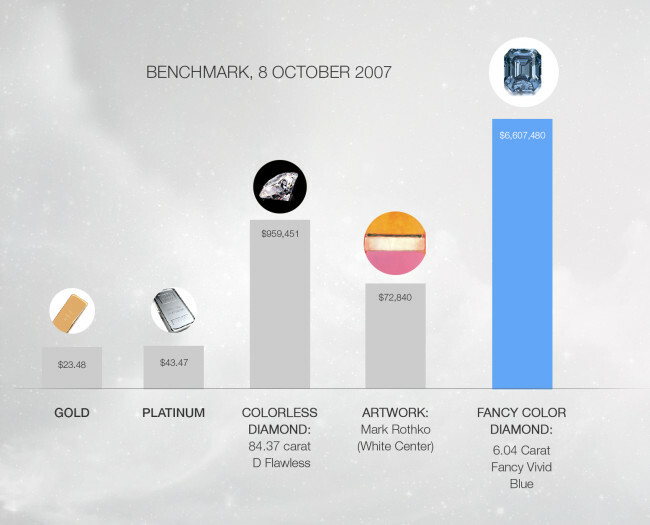 For the first time in our research, gold value is higher than platinum. The most expensive colorless diamond sold that year was the Elizabeth Taylor diamond (her engagement ring from Richard Burton)- a 33.19 carat D color Flawless emerald cut diamond, the most expensive color diamond was a 6.01 carat Fancy Vivid Blue cushion shaped diamond, and the most expensive artwork was Picasso’s Jeune Fille Endorme. Colorless diamonds made a major push with a 124% increase from the 2 previous years. Artwork took a step back, not by overall price, but by the concentration of that price into a much larger painting. Fancy color diamonds also took a breather after such a long run increase since 2003 (a cumulative increase of 317%). Fancy color diamonds continued to lead the group, and colorless diamonds moved back into 2nd place (after being 3rd in 2009). In 2013,gold retreated slightly, coming down 15%, and platinum took back its spot ahead of gold. 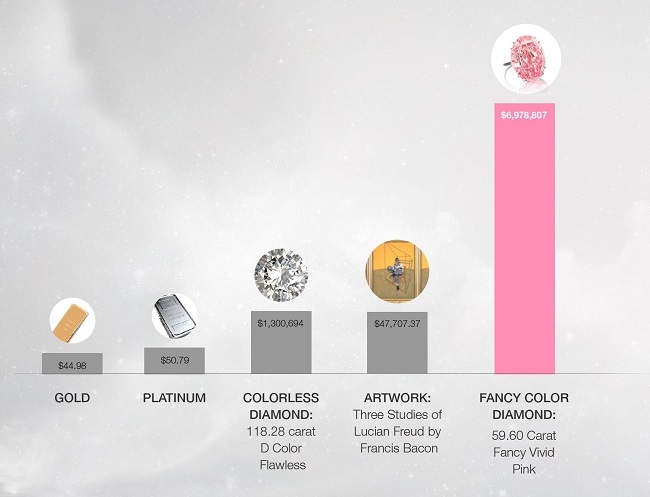 The most expensive colorless diamond sold that year was a 118.28 carat D color Flawless round brilliant diamond, the most expensive color diamond was a 59.60 carat Fancy Vivid Pink oval shaped diamond called the Pink Dream, and the most expensive artwork was Francis Bacon’s Three Studies of Lucius Freud. The colorless diamond record retreated 2%, after a major run from 2009. Artwork valuation increased based on an overall price paid, with a new record, yet due to the huge size artwork style called triptych, the wealth concentration has decreased to less than half. Fancy color diamonds underwent the same effect. A new overall record was broken for price earned at auction, but due to the size of the diamond and the financial capital needed, it too decreased in concentration valuation. In 2015, the 2 winners were fancy color diamonds (holding the top position since 2003) and artwork. Gold had a further setback with another 13% drop, while platinum fell by over 27% and took second place again behind gold. 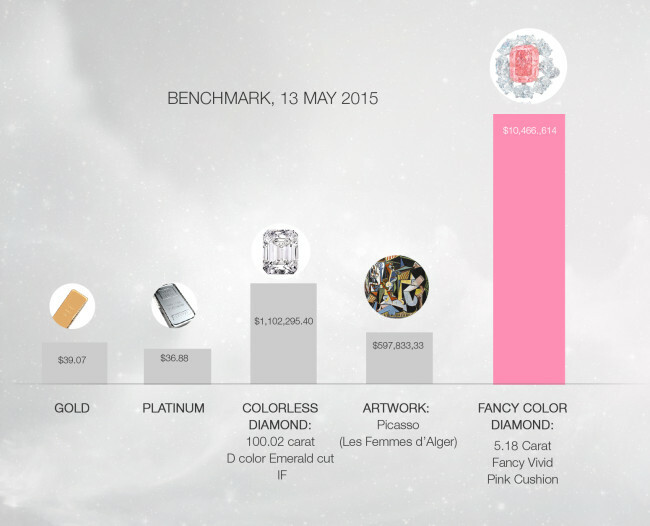 Colorless diamonds took a slight breather and remained above $1m per gram as they had since 2011. Artwork made headway with a 12 fold increase in value, which was caused by the size of the artwork that was sold, but it still made a new world record. Fancy color diamonds made a major comeback on a per gram value of above $10 million, a position it had back in 2009.
in 2017, gold remained stable, while platinum lost almost 20% of its value compared to 2015. Colorless diamonds have lost some value with a decrease of 10% in wealth concentration ability, but lost almost 20% per carat value. Artwork took a big leap this year with an incredible sale of Leonardo’s last work held by private hands. the overall increase in terms of dollars was a fantastic 151% value increase since Leonardo’s Salvator Mundi was sold for $450 million and back in 2015, Picasso’s Les femmes d’alger sold for $179 million. Fancy Color Diamonds have broken the 2009 record for wealth concentration. back then it was $10.83 million per gram, while this year it is $14.47 million per gram, a 33.6% increase. our conclusion this year remains the same, go to the bottom line below! Our research encompassed major real asset valuation going back to 2003. 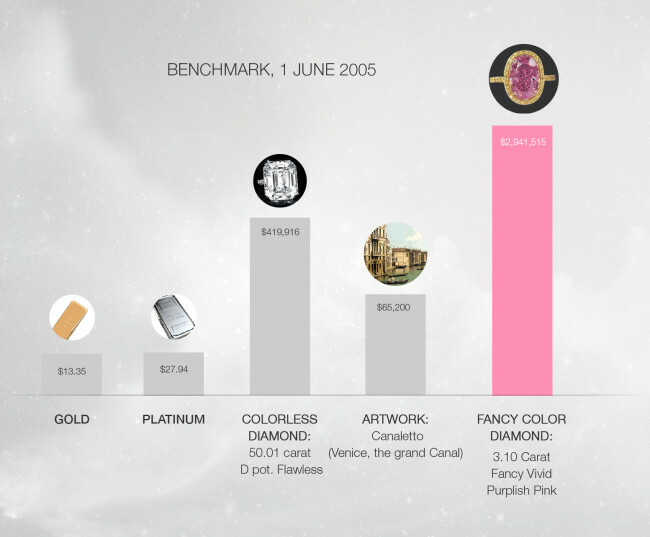 Over the period in question, gold had an overall increase of 199%, platinum increased by 41%, colorless diamonds increased by 234%, artwork was a major winner with an overall increase of 1011% and fancy color diamonds made a total of 417% return. The most notable reason for this among many is the lack of education about and understanding of fancy color diamonds for the last 30 years or so, because it is only in the last 10 years that the market had started to understand and appreciate them. Fancy color diamonds lagged behind artwork investment for a very long time, and only in the past few years have they been gaining traction. I foresee that in the next 5-10 years, the broader market will be much more informed and educated about fancy color diamonds, and thus the influx of capital and investment dollars will be pouring into this niche. I am quite confident that we will see a major price breakthrough for the overall fancy color diamonds market, and even more so into the Investment grade diamonds market. Something tells me that we will see new and major record breaking prices and wealth concentration in the fancy color diamonds market faster than we think. Fancy Color Diamonds to remain the top Wealth Concentration Vehicle.